Home News How is bird netting manufactured? How is bird netting manufactured? Bird control netting is the only bird proofing solution that places a physical barrier between the pest bird and its intended destination. Bird netting is especially suited to protecting large surface areas, for example, industrial roofs. Bird netting is manufactured from extruded 630 denier (0.3mm thick) high density polyethylene (HDPE) monofilament. HDPE is supplied in beads or granules which are melted and mixed with additives that may include colour pigments, ultraviolet filters and flame-retardant ingredients before being extruded into a 0.3mm monofilament. To make the finished twine, the monofilament is twisted into a bundle of three and again into a bundle 3×3 to make the finished twine of nine monofilaments, approximately 1mm in diameter. This twine is referred to as 12/9 construction. The finished twine has a breaking strength of 14kg, and when made into a net, the breaking strength can be much greater. The loom joins the twine together into a knotted mesh, which is then subjected to a five tonne load to pull the knotted junctions tight. Then the knots are subjected to a high heat source which sets the knotted junctions and prevents slippage. All bird netting comes off the loom in a diamond configuration. The nets are hand-finished using highly skilled labour. They are squared off, then cut down to size or joined together to make larger sizes. Smaller mesh size nets will relax back into a diamond shape and will need to be stretched out to shape before installation. Joining nets neatly and accurately is one of the most highly skilled jobs in the manufacturing process as it is all done by hand. 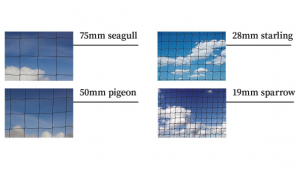 To reduce cost and weight, we use the largest possible mesh size that is applicable to the species of bird concerned. Larger mesh nets are less susceptible to wind loading and less visible. However, we have to select the appropriate mesh size for the species of bird concerned. Size options available include 75mm seagull, 50mm pigeon, 28mm starling and 19mm sparrow. When proofing against multiple species select the smallest species mesh size.